Last Monday, May 17th, I was one of the thousands of people who had the privilege of attending the grand opening of the Brown v. Board of Education National Historic Site, commemorating the 50th Anniversary of the U.S. Supreme Court’s decision overturning the “separate but equal” doctrine. 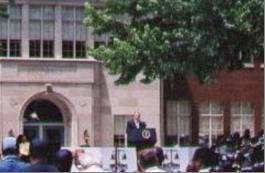 Several dignitaries also attended the ceremony, including President George W. Bush. It was a fitting celebration for the landmark case which clearly established that separate educational facilities were “inherently unequal", thus violating the 14th Amendment to the United States Constitution which guarantees all citizens equal protection under the law. Ordinary people – just like you and me – changed the way an entire class of people would be treated. They knew in their hearts that they weren’t any different than their white neighbors. They knew in their hearts that it was inherently wrong for their children to be forced to walk clear across town past other schools to attend a dilapidated old schoolhouse. They knew that their facilities were not separate and equal, as the law required, but rather separate and unequal. But most felt powerless to do anything about it. Those few who took the risk and fought for what they believed in made a huge difference – not just for their children, but for black children everywhere. Barbara Rose Johns from Farmville, Virginia, was one of those courageous teenagers who led a student strike in the fight for integrated schools. “It was something I just had to do,” she explained. Death threats later forced her to leave the state. The following is an excerpt of Barbara’s thoughts taken from the script of Now Let Me Fly. But my embarrassment is nothing compared to my hunger. I'm not talking about my hunger for food, though it would be right nice to have a cafeteria with lunch instead of just sticky buns like we get. No, I'm hungry for those shiny books they have up at Farmville High. I want the page of the Constitution that is torn out of my social studies book. I want a chance at that "Romeo and Juliet" I've heard about but they tell me I'm not fit to read. or embark on a fight? no lawyer bills to juggle. if Rosa Parks had backed down? and one day they'll come true. Of a young life lost? Although I did not know the 29-year-old man who was tragically killed in an auto accident near Alta Vista last week, I do know that he was somebody’s son…. and husband…. and father. My condolences go out to this young man’s family. It grieves me to think about the depth of their anguish and pain. I would like to share the following poem which I wrote exactly one year ago in honor of several people from our area who left this world far too soon. How will your families live without you? Why did they have to leave this world? Why are they too soon gone? I was sitting, torn by grief. Someone came and talked to me of God’s dealing, of why it happened, of hope beyond the grave. He talked constantly; he said things I knew were true. I was unmoved except to wish he’d go away. He finally did. Another came and sat beside me. He just sat beside me for an hour and more, listened when I said something, answered briefly, prayed simply, left. I was moved. I was comforted. I hated to see him go. 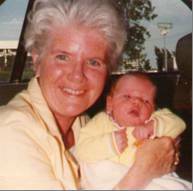 I’d like to dedicate this column to my mother, Margaret (Peggy) Van Kirk, who died from breast cancer fifteen years ago on May 7, and to my sister Peggy, who was named after her. 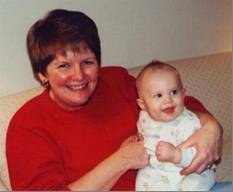 Sadly, Mom passed away one day after Peggy’s 40th birthday. We all miss her terribly, but as the mother of nine (six girls and three boys), she left us the greatest gift of all…..each other. The child asked God, "They tell me you are sending me to earth tomorrow, but how am I going to survive, being so small and helpless?" Again the child asked, "How am I going to be able to understand people when they talk to me if I don't know the language?" God said, "Your angel will tell you the most beautiful words you will ever hear, and with much patience and care, your angel will teach you how to speak." God said, "Your angel will place your hands together and teach you how to pray." "Your angel will defend you even if it means risking her own life." God said, "Your angel will always talk to you about Me and will teach you the way to Me, even though I will always be with you." The Lord leaned down and whispered softly in the child’s ear. “You will simply call her Mom." She came to see him and share in our pride. Thanks God for our Anchor this day.